[140 Pages Report] MarketsandMarkets expects the global Computer-Aided Manufacturing market size to grow from USD 2.3 billion in 2018 to USD 3.4 billion by 2023, at a Compound Annual Growth Rate (CAGR) of 7.6% during the forecast period. Growing industrial and robotic automation is expected to boost the growth of market across various industries globally. CAM solution enables enterprises to efficiently design and manufacture products with the help of CNC machines. CAM helps organizations to minimize errors in designing and manufacturing processes. Computer-Aided Manufacturing market solutions can be easily integrated with the designing tool, thereby providing enhanced ability to adapt changes and increase the efficiency of manufacturing processes. the solution enables organizations to manage design changes in an easy and fast manner. The solution empowers various stakeholders in an organization, including machinists, designers, and engineers, to carry out their tasks effectively, thereby, reducing the overall time taken in the manufacturing of a product. The Computer-Aided Manufacturing has been segmented into components, which include solutions and services. Services are further categorized into training and education and support and maintenance. Cloud-based services reduce the overall costs while providing highly flexible and scalable access to solutions. Security of manufacturing operations is higher in on-premises deployment type. However, cloud-based CAM solution enables organizations to reduce the overall costs associated with solution, IT infrastructure, storage, and technical staff. The cloud-based solution is a good option for organizations with limited budgets, as cloud offers enhanced speed and scalability. In today’s highly competitive automotive industry, companies are looking forward to adopting smart manufacturing technologies for reducing the manufacturing cycle time. Automobile manufacturers emphasize on continually improving their manufacturing processes through the adoption of various technological innovations for ensuring the delivery of quality products. 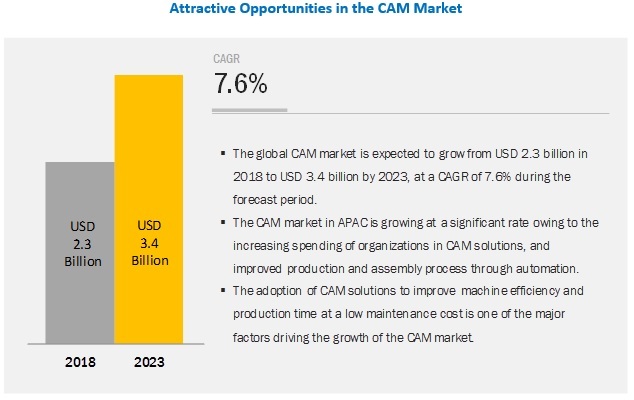 Technological innovations, latest machines, equipment, and use of CAM solution in automobiles manufacturing processes have helped automakers and fabricators to reduce the production time significantly and enhance the overall efficiency of manufacturing. 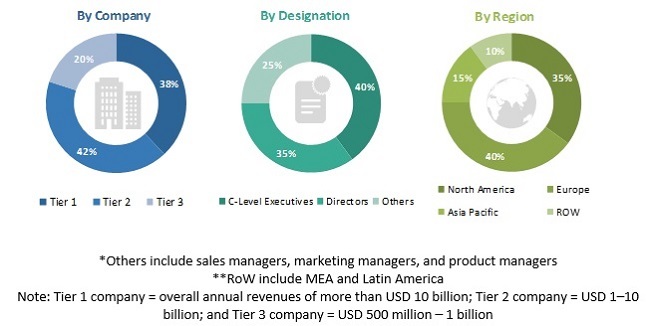 Furthermore, the increased adoption of smart technologies and Internet of Things (IoT) powered solutions, such as connected cars, connected logistics, predictive maintenance, and connected fleet, has created several opportunities for global Computer-Aided Manufacturing market. North America is expected to hold the largest market size and dominate the Computer-Aided Manufacturing market from 2018 to 2023. North America is a major hub for technological innovations and an early adopter of new technologies. Increased adoption of cloud-based CAM solution for enhancing manufacturing process and automating production has boosted the Computer-Aided Manufacturing in North America. The presence of major players in the region also supports the demand and awareness regarding the CAM/CAD/CAE technologies. Adoption of IT as well as enabling technologies in process industries is rising owing to the need to track the real-time data and improve visibility and control on production activities. Key factors driving growth in North America are shifting toward automated production, an established ecosystem for manufacturing practices and continuous Research and Development (R&D) investments by manufacturers to drive innovation into their manufacturing processes. The major vendors include Autodesk (US), Dassault Systèmes (France), Hexagon (Sweden), Siemens (Germany), 3D Systems (US), PTC (US), HCL (India), CNC Software (US), OPEN MIND Technologies (Germany), DP Technology Corp. (US), MecSoft (US), SolidCAM (US), NTT DATA ENGINEERING SYSTEMS Corporation (Japan), BobCAD-CAM (US), ZWSOFT (China), and SmartCAMcnc (US). Autodesk is one of the leading players in the Computer-Aided Manufacturing market across the globe. The company offers CAM solutions to enhance and fast track manufacturing processes of enterprises operating in various industries, including architecture, engineering, construction, product design, manufacturing, and entertainment. Autodesk has built a strong brand value in the global ecosystem, catering to its clientele across different industries. As a part of its growth strategy, in December 2018, Autodesk acquired PlanGrid to develop complementary construction software. Autodesk’s BIM 360 construction management platform connects people, data, and workflows on construction projects. In February 2019, Dassault Systèmes signed an agreement to acquire elecworks product line from Trace Software International. Elecworks product line comprises electrical and automation design software, which would empower Dassault Systèmes to strengthen its foothold in various industries including industrial equipment, high-tech, and energy. In December 2018, Siemens acquired COMSA Computer and Software GmbH, a Munich-based company. COMSA is a software provider for electrical systems design and wire harness engineering. The acquisition would take the electrical system to a new level for meeting the development of the electric and autonomous vehicle. In December 2018, Autodesk released Netfabb 2019.1, an updated version of Netfabb 2019, launched in the summers of 2018. This updated version is enriched with significant enhancement including CAD-friendly interface, new machines integrations, and some updates to Netfabb Simulation to speed up the process and improve the accuracy of results. In October 2018, BobCAD-CAM partnered with 2SQ Industrial Supply Inc, a US-based CNC equipment supplier. 2SQ designs and builds robotic or automation production systems for the high-production powder metal industry. This partnership has led BobCAD-CAM to provide CAD-CAM solutions in Pennsylvania and Virginia. In December 2018, Hexagon released a new version of VISI software to boost reverse engineering. It also comprises new and improved CAD/CAM functions for the die and mold market. How is the adoption trend of CAM solution across major economies? What are the challenges faced by vendors in the global Computer-Aided Manufacturing Market? Describe the potential of emerging application areas of solutions. Provide insights on global market concerning different industry verticals? Describe the evolution trends of the market. The study involved 4 major activities in estimating the current market size for the Computer-Aided Manufacturing market. Exhaustive secondary research was done to collect information on the market. The next step was to validate these findings, assumptions, and sizing with industry experts across the value chain using primary research. Both top-down and bottom-up approaches were employed to estimate the complete market size. 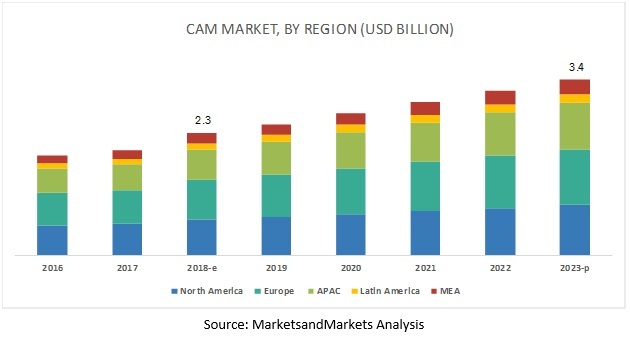 After that, the market breakdown and data triangulation procedures were used to estimate the market size of the segments and subsegments of the CAM market.